On the hunt for a Bellinger rookie, I purchased a hanger box of 2017 Topps Heritage High Number. 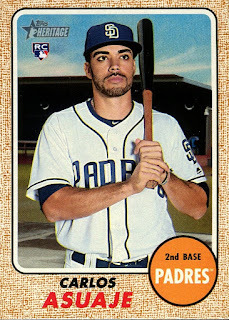 I have his Topps Chrome rookie, which won't cut it. 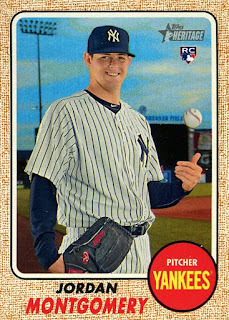 I much prefer the design of Heritage of regular Topps. No Bellinger cards were found. Instead, I found a few other nice rookie cards and one amazing non-rookie. 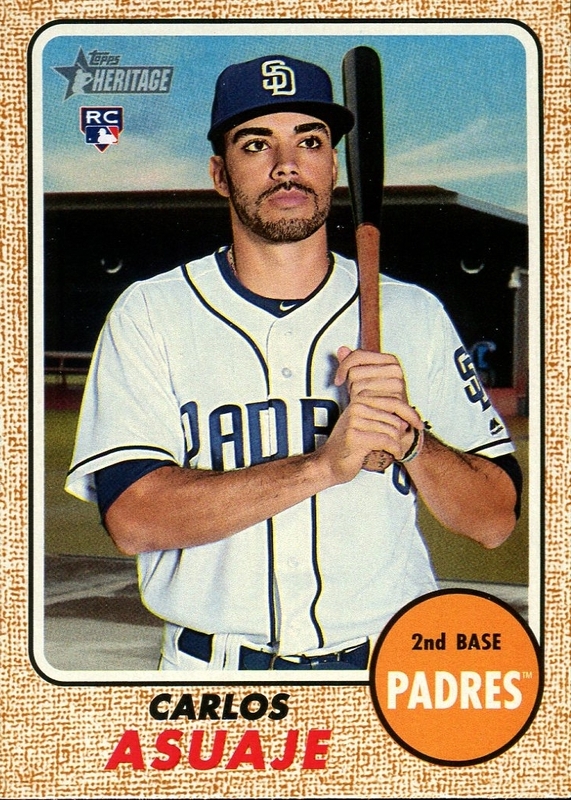 Asuaje, along with Manny Margot and others, was acquired from the Red Sox in the 2015 offseason in exchange for Craig Kimbrel. He was promoted from AAA at the end of June this season and became a fixture at 2nd base. He didn't much for power with only 4 home runs and 14 doubles in 89 games. However, he had a respectable .270 batting average and .334 on-base percentage. Asuaje also played well defensively this year. Starting pitcher Jordan Montgomery pitched his way onto the Yankees' ALDS roster after going 9-7 with a 3.88 ERA this season. He was a back-end starter this year and I doubt he will make a start in this first round. Tanaka pitches Game 3 and I'd be shocked if Severino does not start Game 4. Corey Kluber is scheduled to start Game 5 for the Indians so the Yankees might send Gray back out on the mound. One of these cards is not like the other. Actually, I'm not so sure. 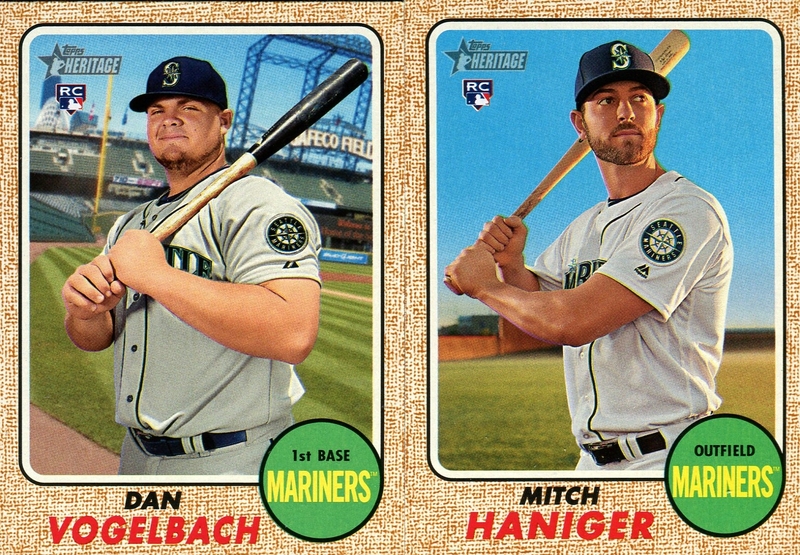 Vogelbach is obviously Photoshopped into Safeco Field. At first glance I thought Haniger's background was legit but now I'm not so certain. 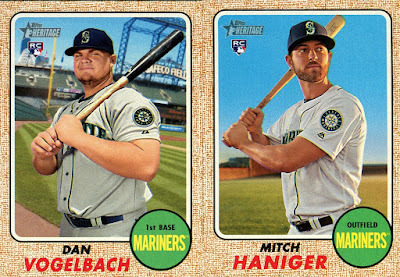 Even if it is, the background looks much more realistic than Vogelbach's. Haniger started off the year red hot, slashing .342/.447/1.054 through 21 games. That was until he suffered an abdominal injury. Upon his return, showed little signs of life, slashing .203/.303/.618 through 37 games. Haniger suffered another injury, this time taking a Jacob DeGrom pitch to the face. After coming back from that injury, he posted a slash line of .318/.344/.923 for 38 games. A weird turn of events if you ask me. Vogelbach on the other hand, he doesn't have a good excuse for his limited performance in the big leagues. Granted he has a grand total of 44 plate appearances in the majors. Sample size beware. Still, it's clear the Mariners do not consider him a long-term solution at 1st base. I really like the look of these playing card inserts. 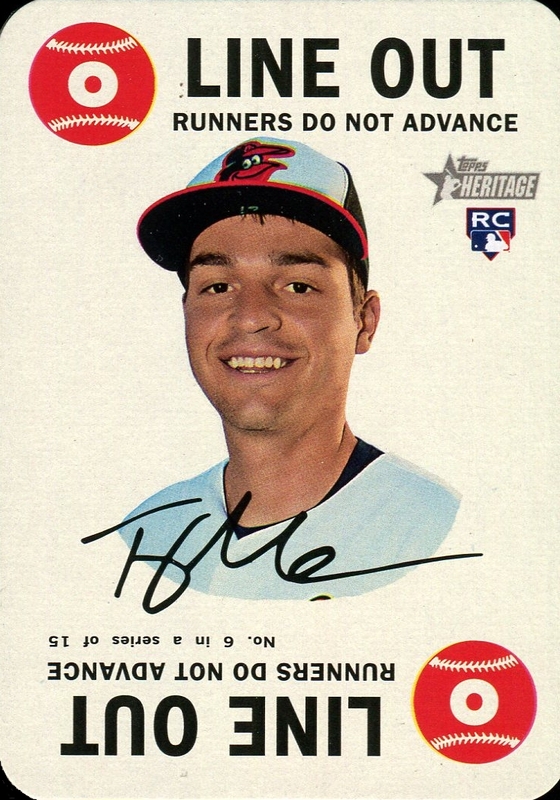 Trey Mancini is rightfully overlooked due to the likes of Judge and Bellinger but he was still a solid contributor for the Orioles. 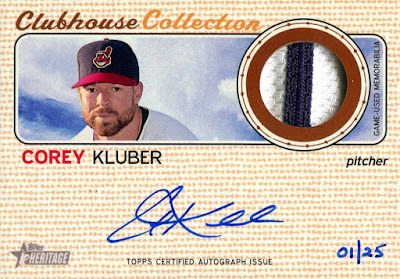 An on-card patch autograph of the likely 2017 AL Cy Young award winner, Corey Kluber. The card is serial numbered 1 out of 25, which is even better. There is something nice looking about having serial number 1. The jersey stripe is also well appreciated. 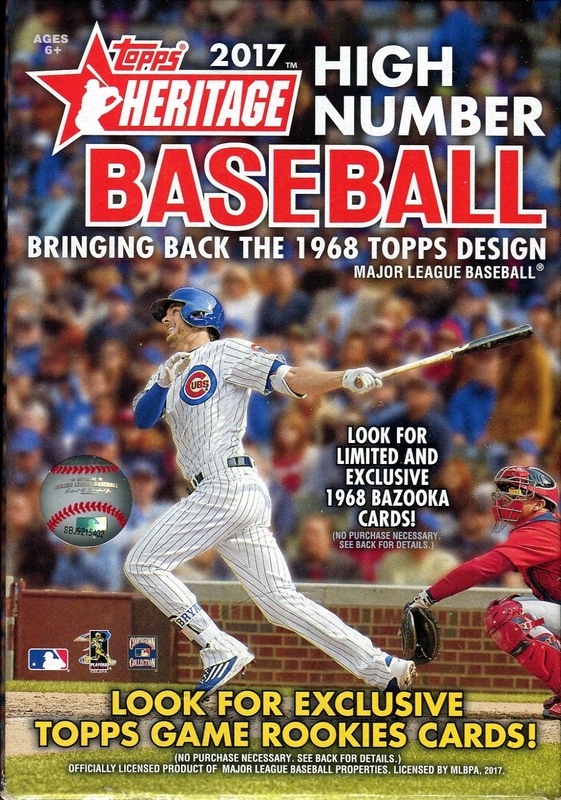 Looking at the checklist for this insert set, I could have only done better by pulling a Derek Jeter. I'd normally be disappointed about not getting a Bellinger rookie but I think the Kluber autograph is a nice consolation prize. 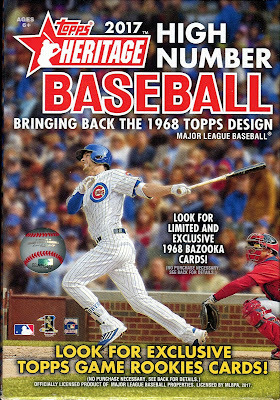 Now that I'm down stirring up trouble with Panini, it's time to return to the 30-Day Baseball Card Challenge! My affinity for 1980s cardboard is not that high. I was not a collector during that era. Any cards I received were after the 80s ended. 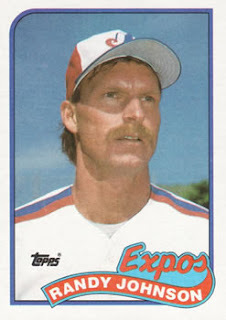 I selected this card because it's a Randy Johnson rookie card. Although he was traded away from the Mariners far too early, I will always remember watching him pitch for Seattle. A song from my preteen years? It is really hard to think back that far and remember what I was listening to. The only thing that sticks out in my mind is Rosenshontz. Rosenshontz was a children's music duo from the 70s and 80s. I had (and still have) a couple of their tapes while I was living in New Hampshire that I listened to regularly. The music and lyrics are obviously kid friendly. At the same time, the songs are not so obnoxious that adults' ears would bleed. The songs range from are a mix of folk and rock. The song above sounds like it could be a Van Hallen song. This song doesn't have it but sometimes it sounds like Bob Odenkirk is singing. Unfortunately, that's not the case.